Holiday Gift Guide Pick- Ain't It Cool News "an innovative concept, featuring unusual images of a feline that's become an Internet sensation. Subtitled 'Disgruntled Tips and Activities Designed to Put a Frown On Your Face, ' the slim, colorful book is likely to make you frequently laugh out loud." - Lansing State Journal "Grumpy Cat's online fame is undeniable. 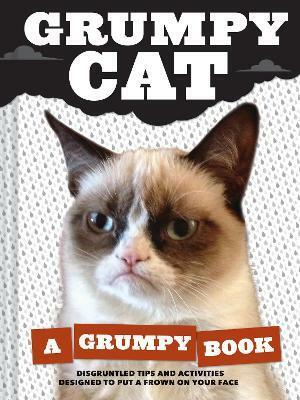 But cranky Luddite readers who cling sourly to the printed page can discover her charms ...with the arrival of 'Grumpy Cat: A Grumpy Book.' A Web star for our anxious times, Grumpy Cat also is an unofficial mascot for sufferers of bad-attitude resting face, which goes by another name that rhymes with itchy. Clearly, Grumpy Cat is currently our favorite peeved pet."